This slow cooker recipe is made with dried white beans, such as navy beans. The beans are cooked in the slow cooker and then tomatoes, tuna, and seasonings are added. It's a simple, rustic dish, and it makes an excellent meal with rice and a tossed salad. See the variations below the recipe for white bean salad with tuna. Use navy beans or great northern beans in the recipe. The dish could also be made with black-eyed peas. In a large skillet over medium heat saute the garlic in the olive oil for about 1 minute. Discard the garlic. Put the drained beans in the slow cooker along with the garlic flavored oil and add 6 cups of fresh water. Cover and cook on high for 1 hour. Reduce the setting to low and cook for about 4 to 7 hours longer, or just until the beans are tender. The time can vary depending on the slow cooker, the age of the beans, and water hardness. If you aren't sure, begin checking the beans for doneness after about 4 to 5 hours. Add the tomatoes, tuna, and basil. Taste and season with salt and freshly ground black pepper, to taste. 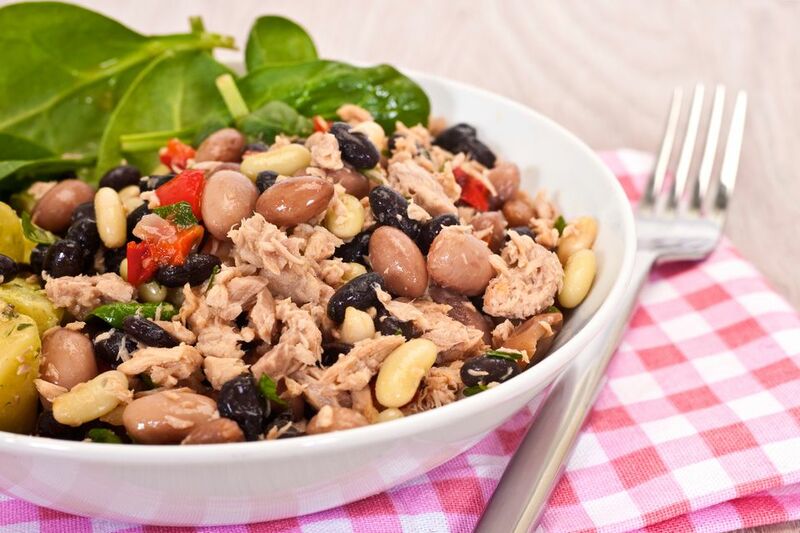 Tuna and White Bean Salad - After the beans are tender, remove them and drain; chill thoroughly in the refrigerator. Combine the chilled beans with the tomatoes tuna, basil, and seasonings, along with chopped red onion, if desired.